Orange Jam - Mrs [Costobadie?] Three quarters of a pound of sugar to 6 oranges squeese the oranges through a seive pick out all the pulp but take out the inside skins. Boil the outrind in several waters till they are quite tender. then with the pulp boil it on a very slow fire two yolks of Eggs. to three tablespoonfuls of this orange, when you use it for tarts. which it makes them very good. 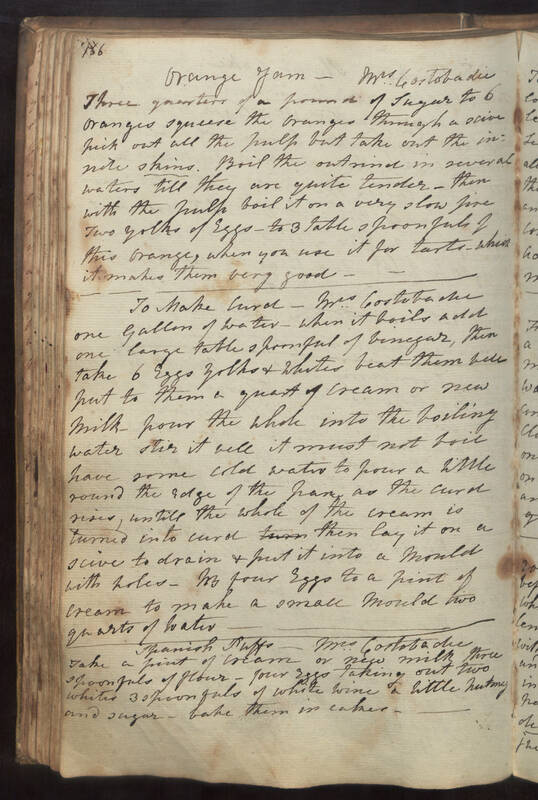 To Make Curd - Mrs Costobadie one Gallon of water. when it boils add one large tablespoonful of vinegar, then take 6 Eggs yolks & whites beat them well put to them a quart of cream or new milk. pour the whole into the boiling water stir it well it must not boil have some cold water to pour a little round the edge of the pan as the curd rises, untill the whole of the cream is turned into curd then lay it on a seive to drain & put it into a mould with holes. NB four Eggs to a pint of cream to make a small mould two quarts of water. Spanish Puffs - Mrs Costobadie Take a pint of cream or new milk three spoonfuls of flour. four Eggs taking out two whites 3 spoonfuls of white wine a little nutmeg and sugar. bake them in cakes.